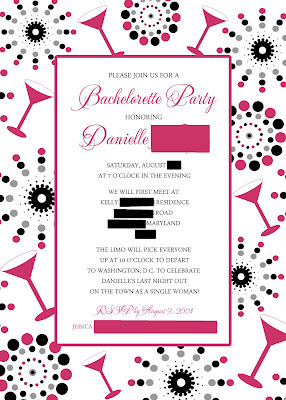 I absolutely adore this perfectly flirty bachelorette party invitation design that I created for Danielle's upcoming bachelorette party. I have worked on numerous projects with Danielle for her upcoming wedding and am actually in the process of working on several more as well, but on these designs I worked with her good friend Jessica who is actually hosting the bachelorette party. Jessica mainly wanted something fun and appropriate for the ocassion, but in general was very open to giving me creative control for this project. (which I always LOVE by the way) We did chat about a few different options just to get some ideas rolling initially and after that, I truly just ran with it and put together this sassy little number! I was more than pleased, (okay, completely escastic actually) about the way the invitations came out and was even more thrilled that Jessica loved them as much as I did as well! I hope that Danielle has a wonderful time out with her best of friends and I cannot wait to hear all about their fabulous night out on the town!